The venue was pretty much the same as any other convention. I had a bit of table, people are walking past looking at all of the neat things, all of the main things that define running a stand at a convention were pretty much the same as normal. Where there were differences it was in the people – but conventions are mostly about the people so that’s a big difference. As will become increasingly obvious as I post photos, everyone looked fantastic! While a games convention isn’t populated by people who have gone out of their way to worry about how they look, the comics convention was full of people who’ve spent months preparing the perfect costume. Not everyone was taking this approach, but I couldn’t help but feel later in the day while I was playing someone dressed as Gambit at a card game (which I’m sure made me at least 10% more cautious than I’d usually be) – perhaps I could’ve picked an appropriate game related getup. It’s probably futile to say “Also learn what everyone else might be dressed as” because of the sheer number of characters that there are. However speaking to a couple of people going and getting an idea of what might be popular seems like a good idea. I’m pretty sure that I offended someone by misidentifying their costume and “I called you the wrong thing” can come across as “The costume you put effort into is bad and I can’t tell what it is” rather than “I have literally never encountered the character you’re dressed as”. I suppose my advice for people going forwards would be don’t guess until you’ve established enough of a rapport that it’ll be okay to be wrong. I don’t want to talk much more about costumes, because it’s only a skin deep thing and not the most important part of being a board game designer at Comicon, but it’s worth a small mention that some types of costume make things more challenging. Not being able to make eye contact with someone is quite disconcerting. Gloves make it harder to handle components. Sweeping sleeves have an inherent desire to clear the table if a player has to reach for something in the middle of the table. Think about these things when you lay out your stand. If necessary make things inconvenient for yourself in order to make it easier for people who may have a costume disadvantage. For instance by the halfway point I’d got used to either putting draw decks nearer the far side of the table rather than in the middle, or adapting play slightly so that the host hands out cards rather than a player needing to draw them. 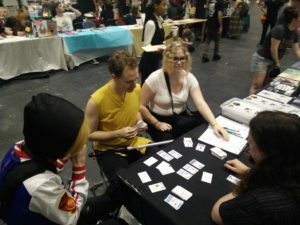 So let’s move from something quite superficial to something that had a big impact: While there were obviously board game fans around and there was a space in which people were playing board games, almost nobody was demoing them on their stand. Being the only demo game in town has advantages and drawbacks. A surprisingly big one was: We had chairs. On which people could sit. People who are walking around a large convention floor for an extended period of time would do basically anything if it involved sitting down. While I believe in the game I’m working on and think it’s great fun, I suspect that this was one of the main reasons that I barely had a couple of minutes go by without starting a new demo game for the whole con. Perhaps the most useful piece of advice for doing this sort of thing would be: Get more chairs than you think you need. Another is the novelty value. People are expecting to look at a lot of pretty things and speak to people about awesome things, but they’re not really expecting to get to do the thing. It’d be super rude to sit in front of someone’s comic stand and read one of their comics from cover to cover and then leave without buying anything, most people wouldn’t do it (I’m sure some people do because people are terrible). Getting to join in with a thing and actively engage with it is an activity that you can offer as a game designer and that generates a certain amount of interest. There is a downside to the novelty though: A lot of the people joining for games weren’t gamers. Now on some level’s that is perfect for this game, it’s aimed at a webcomic audience and doing tests outside of usual playtest groups is desperately important. However it also means that people handle things differently. An audience that’s used to thinking of a card as a critical piece of a £80 game that will ruin the game if it’s destroyed and an audience that’s used to thinking of a card as a disposable thing from an easily replaced £2 deck of playing cards treat cards differently. There’s more bending, folding, spindling and mutilating. There’s more happiness about holding them alongside drinks or other miscellaneous sticky things. The prototype did not really survive the weekend – so that’s another lesson: Carry one more spare prototype than you think you need if you’re not dealing with a predominantly gaming audience. Overall though, the trade off is more than worth it. An advantage I didn’t expect to encounter was that for a while I found it easier to work on the game. The novelty of the surrounding meant that people approached it with greater enthusiasm and (hopefully) the quality of the game carried that feeling through the play. Seeing people get enthusiastic about a game is one of my main motivations to design, so it always gives me a boost. For this convention I was partnered with the Scandinavia and the World team and in truth what I’ve been referring to as “my table” was really the last few feet of their impressive display. 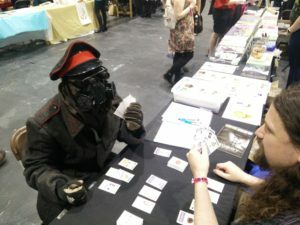 I think it helped a lot to be connected to a webcomic stand, because people would look at all of the things they had out on display and I provided a handy “Would you like to see more? We have a game you can play” when there were no more things to look at and someone else was already looking through the box of prints. I think if I was going to do this again it’d be nice to be partnered with someone. If I had a game that had the Comicon folks as its target audience but wasn’t linked to a specific webcomic I might still look to do a deal with an existing exhibitor to go to the convention together. Perhaps commissioning them for a piece of art to put onto a promo card or something like that. It was definitely good to be working with decent people throughout the convention. Thanks for the cracking article, excellent look at diversifying into different potential promotional opportunities. Really interesting about the ‘disregard’ for your prototype. How did you handle the people who started damaging the cards? Well none of the damage was someone tearing a card into tiny strips and swallowing them – it was all stuff in the “If you keep treating a card this way in the long term it will suffer” category. 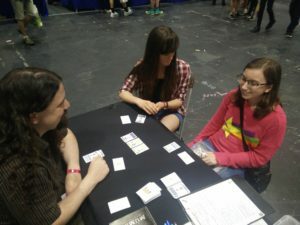 Since a prototype is flimsier than a finished product this treatment started to show by the end of the convention and some cards in the deck were effectively marked – but it didn’t matter since everyone except me was playing for the first time so the markings didn’t really change the game. So basically – I let them do it. 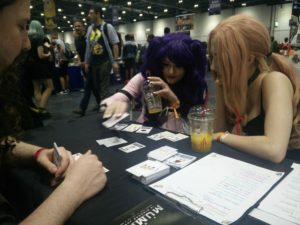 If I felt comfortable with someone I’d give them advice on handling cards in the form of “If you have a nice game and want to look after it then…” but I did so after the game so i was clear I was trying to help them out with their things rather than getting precious about my own. Thanks for such an excellent article, explaining all possible alternatives for marketing. It is also interesting to follow the comments, as you are replying to great questions! Keep up the good work!